On one hand where rummy or online rummy (which is more commonly played these days) is played with cards sitting at home, the other one, cricket, is played with bat and ball at the fields. Despite their different styles, both need skills. Skills to make sequences and sets to win is required in rummy and skills to meet and/or chase the target set by the opposite team is needed in cricket. If you do not create required number of sets and sequences before everybody else in the game table, then you will lose. And if you do not chase your target or make a target not easy to achieve by your opponent, then you and your team will lose. 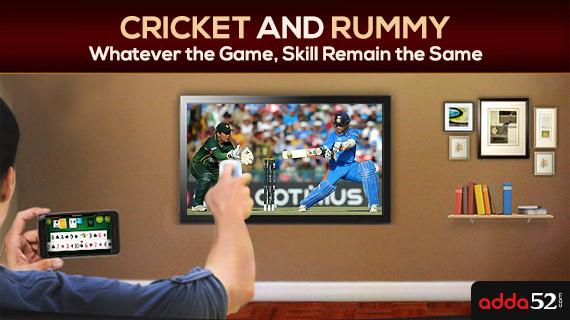 With skill, both rummy and cricket need a slight bit of chance as well. Players have to know the rules of the games and to follow them skill are required. However, even after having the skill, chances/odds to win are also required. Chances in Indian rummy are based on the Jokers you have in your hand cards. The more Jokers you have, the more chances of winning you can expect. If a player has made one pure sequence in 13 card rummy, then having maximum Jokers can make him/her win easily and instantly. While chances in the game of cricket are the pitch conditions of the ground, health conditions of the players, and weather conditions. It is preferred to play cricket on drier periods of the year, however, weather conditions are still major factors. Cricket cannot be played on wet weather as dampness of the ground bounces the ball on the ground. Moreover, health of a key player is another factor that is chance driven, if he falls ill then chances of winning may decrease. In this way, both these highly played games of India are skill as well as chance driven. While skill can over ride the chance bit in both the games, chances/odds can never over write the skill involved.